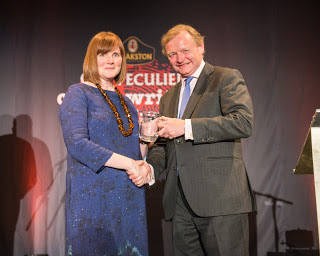 Last night in Harrogate, Sarah Hilary was named as the winner of the Theakston Old Peculier Crime Novel of the Year Award for SOMEONE ELSE'S SKIN. Hilary is a relative newcomer to the British crime fiction scene, but has made a big splash with her DI Marnie Rome series, gobbling up both critical and reader acclaim. SOMEONE ELSE'S SKIN introduced readers to DI Marnie Rome, who walks in on an attempted murder while visiting a women's refuge to take a routine witness statement. Radio Times TV editor Alison Graham, who was on the judging panel, described Hilary's novel as "an emotionally exhausting and powerful story". Programming Chair Ann Cleeves called this year's shortlist "really strong", and said the judging panel, which was assisted by a reader vote during the process, felt Hilary's debut was "so finely written and tightly written"
Simon Theakston, executive director of T&R Theakston, said "It was a very tough decision as it is every year as all the books on the shortlist were outstanding but I’m delighted to hand the trophy to Sarah". The 2015 Award is run in partnership with T&R Theakston Ltd, WH Smith and the Radio Times. Hilary collected a £3,000 cash prize, as well as a handmade oak cask provided by Theakstons Old Peculier.